The Highams Park Planning Group (“HPPG”) is group of local people. It was established at a Launch Event on 16th November 2013. The Launch Event was attended by hundreds of residents from the Highams Park Area and nearly 1,000 residents have now joined as members. HPPG was formally constituted by its members on 17th January 2014. HPPG’s aim is to create a Community Plan (“The Highams Park Plan”) for the Highams Park Area. The Plan will be created by local residents, for local residents, using decision making powers granted to local communities under the Localism Act of 2011. The Plan will be in two parts: A Neighbourhood Plan which will be a formal document covering land use and planning issues in the Area and an Action Plan which will cover community projects that local people tell us they want implemented. The Area that the Plan will cover is the area within the blue boundary on the map, click here to see the map. HPPG has the full support of the Council and was designated by the Council on 15th July, 2014 as the planning group for the Highams Park Area. HPPG will now be the planning group for the Area for the next five years. The Council is holding in trust a £20,000 government grant that will pay for creation of the Highams Park Plan. It means that by participating in the creation of the plan, residents will have more say in how the Area develops to meet the needs of local people. We need your support, so please join up and have your say in the future of Highams Park. The Highams Park Plan will target development over the next fifteen years and, hopefully, through renewal and review will continue to deliver residents’ aspirations for even longer. Creation of the Plan is in its initial stages and we are still gathering ideas and consulting with local residents. We will show the draft plan to local residents for comment. We will then change and adapt the Plan until we get a plan with which the majority of people in the Area are in agreement. We do not know when the Plan will be finished but hopefully by mid 2015 (although it may take longer). 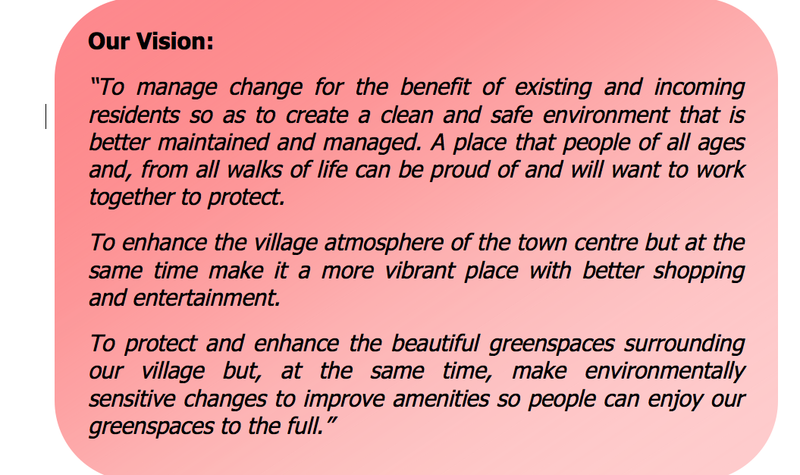 When the Plan is finished it will be adopted by the Council and used to guide its planning policy. Why do we need the Highams Park Plan? Highams Park is a loosely defined area that straddles the wards of Highams Park & Hale End, Hatch Lane, Larkswood and Chapel End and, because of this, no one is directly responsible for Highams Park as an area. As a consequence, the approach to development in Highams Park has been haphazard and the area has lacked investment and direction in its infrastructure planning. The Highams Park Plan aims to give the Area a voice and a vision and provide a strategic and long-term plan for the Highams Park Area which is in accordance with the wishes of those living and working in the Area, while recognising the need for sustainable development. Who will own The Plan? Ultimately the Plan will be owned by the people who live or work in Highams Park. It will be updated and monitored by the Coordinating Committee who will work closely with the Council Officers, Local Councillors and other bodies, such as the City of London Corporation & TFL. At the Cabinet Meeting of Waltham Forest Council on 15th July 2014 the Highams Park Planning Group was formally designated as the neighbourhood planning group for the Highams Park Area. We have been chosen as one of a limited number of communities across the country to create a Plan to define its future, covering all aspects of life in Highams Park. This initiative is driven by residents, for residents, and we want as many people to be involved as possible. All ages and backgrounds. We want everyone’s ideas. Your idea could be the one that makes all the difference. If you are interested in this project but haven’t participated to date, don’t worry, it’s never too late.